November 23, 2012 by Zeshan B. Trick to running a post request using jquery is to store the variables in an object then pass the object into the $.ajax or $.post jquery api. Here is an example. 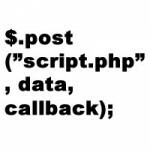 Suppose you have setup a php script(script.php) on your hosting account http://mywebsite.com/yourbook/script.php on the server that accepts a $_post['chapter']; variable from an input field either from a phoneGap or Cordova mobile App. yourbook/script.php script could query a mysql database on server and outputs chapter headings in plain html. To make a post request to this php script to retrieve the chapter headings above to display in jquerymobile listview on your PhoneGap app you would do this: In your App you are using jquery, jquerymobile js files embeded in between head tags. or between script tags inside head tags in your Apps index.html document. Place the following code. The comments in this code explain what is going on. //chlistplease is an object sent as a post request to your script. After it's sent then DoSomethingWithResult function is run. DoSomethingWithResult function is being used as a callback. //this refreshes list view in JQueryMobile after loading data. //This is what starts the whole process. This is telling your App, once document is loaded(document ready) then grab the chapters for 1. 1 here could be a book or it could be grabbing subchapters from chapter one. It's up to you. Thanks for reading. If you have a comment or suggestion please leave them below.